Posted on December 5, 2014 by Billy S.
Formsite makes building a PayPal form easy. Create a form to collect payments for your event registration, e-commerce store, order form, or donation form. Follow the steps below to see how fast and easy it is to set up your integration with PayPal. Before connecting to any payment processor, you will need to build your form. Posted on November 13, 2014 by Billy S.
A primary function of Formsite forms is to send an email notification when a form or survey has been received. In its most basic form, the notification is simply an email. Our added features make your form notifications powerful, personalized, and much more useful. Your new form will not automatically send you an email when your form is completed, so we need to set up a notification at Form Settings -> Notifications. Here you can customize the standard email fields To, From, Subject, and Message. 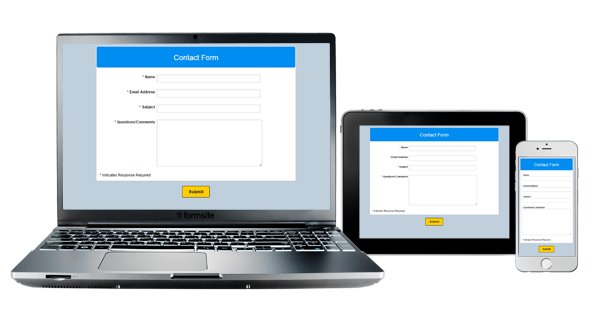 Posted on October 23, 2014 by Billy S.
Formsite forms are now fully responsive, which means that you can build your form to be optimized for devices with different display sizes. Completing a form on a full-size desktop or laptop computer is much different than completing it on a tablet or smartphone. Our responsive forms builder automatically makes your Formsite forms change for the best possible experience on the device you’re using. To repeat: This setting is automatic for all Formsite forms. You do not need to do anything to enable responsive forms. Posted on October 21, 2014 by Billy S.
HIPAA stands for the Health Insurance Portability and Accountability Act of 1996, which provides detailed instructions for safeguarding Protected Healthcare Information (PHI). Any organization that collects and stores this information is subject to these regulations to ensure that the information remains secure. 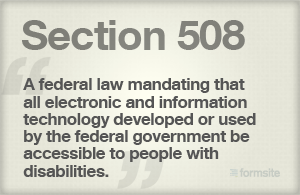 Posted on October 20, 2014 by Billy S.
Formsite forms support Section 508 and WCAG 1.0 (Level AA) accessibility standards. These provisions ensure access for people with vision impairments who rely on various assistive products to access computer-based information, such as screen readers and Braille displays. Screen readers translate what’s on a computer screen into automated audible output and certain conventions, such form field labels, are necessary so that these devices can “read” them for the user in a sensible way. FormSite’s newest release includes a bulk upload tool for files and images. The easy to use drag & drop uploader lets customers with large numbers of files and images quickly upload them to their account. All paid service levels now have access to the new bulk upload tool, located in your account under Account -> Files & Images. Log in to your account and go to Account -> Files & Images. Click the Upload button to see the new uploader window. Drag files into the window or click the Add Files button to select your files. Click the Start Upload button to begin the upload. After the upload is complete, click the Close button to return to the Files & Images page. The bulk upload tool supports common image and document formats: jpg, gif, png, zip, doc, docx, xls, xlsx, pdf. The tool does not support exe files. The uploader will not upload folders – only individual files. The file transfer process will stop when the close button is clicked. Be sure that the upload process is complete before closing the window. Posted on October 8, 2014 by Billy S.
Your form’s success page is an important part of the user experience where form visitors get confirmation that their contribution was successfully recorded, as well as an opportunity for form owners to provide more information. See how your Formsite Success Page can be used for much more than a “Thank You” page. Posted on October 3, 2014 by Billy S.
A valuable feature of Formsite forms is the ability to embed the form into another page or site. 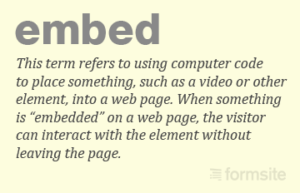 For example, if you need a contact form or order form to add to your site but you don’t want to program your own or link to a form on a different site, you can make your form on Formsite and embed it on your site. Posted on September 29, 2014 by Billy S.
Custom results are a common question topic from Formsite customers. Whether it’s a need to automate the layout and design to save time, or a need to apply the results data in a different format, results customization is a valuable part of our service. Posted on July 29, 2014 by Billy S.
We have received many requests for an easy payment integration option. Stripe is an extremely easy to use, fast to set up, intuitive payment option that accepts the major credit cards from around the world. Their on-page payment form and simple fee structure make it a very attractive and competitive solution. At the time of this writing, Stripe is available for customers in Australia, Canada, Ireland, United Kingdom, and United States, with most of the rest of Europe in Beta. To set up a Stripe account and to learn more about this payment option, visit stripe.com. 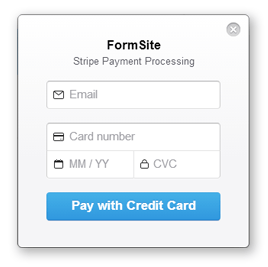 To learn all about how to set up Stripe integration with your Formsite form, visit our documentation page.